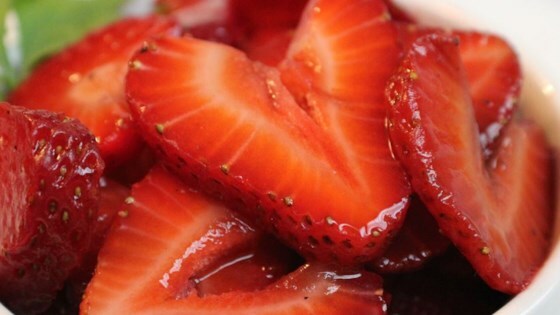 In a large bowl, toss berries with sugar and let stand at room temperature for 10 minutes. In a small bowl, combine the vinegar and pepper. Pour over berries and toss to coat. Divide berries among 4 serving bowls and serve. Enjoy! Tastes only slightly different from plain strawberries with sugar. It wasn't bad, but it wasn't totally different from my other strawberry experiences. Wow! I served this at a party on a bed of spring greens and everyone loved it! We absolutely loved this! It's so quick and easy to make and the pepper adds a nice kick. I'll make this again for sure. tastes great! I will make this one again, but I will double the recipe next time. I love the mix of flavors in this salad. One of my favorites!